As you contemplate different career options as a nurse, you may be interested in learning how to specialize a nursing degree in neurology. Neurology or neuroscience nurses are those who are trained to take care of patients who suffer from either a neurological illness or injury. It’s an important branch of nursing that requires special knowledge and skills. Like most areas of nursing specialization, you need to begin by becoming a registered nurse. That means completing a diploma, an associates degree, or a bachelors degree in nursing, and then sitting for and passing the national exam to become an RN. Although any of these pathways is acceptable to becoming an RN, these days more nurses are going on to complete a bachelors level degree as it opens more career doors. Whatever degree you pursue, if you know you have an interest in neuroscience, try to take some courses that will help you learn more in that area. order to be able to sit for the neuroscience nursing exam. This is the exam administered by the American Board of Neuroscience Nursing. The American Association of Neuorscience Nurses (AANN) publishes a core book that is a good resource for studying for the exam. They also publish other resources that may help you prepare for the initial exam or complete later continuing education. If you pass the exam, you will become certified as a Certified Neuroscience Registered Nurse (CNRN). The certification lasts for five years. After that, you need to become re-certified. Re-certification involves a process of continuing education credits which may involve practice, research, teaching, publication in the field or professional networking. You will need to complete these CE credits in the final year of your current credential before the old credential expires. If you do all that, you will join the ranks of almost 5,000 nurses who decided to specialize a nursing degree in neurology and who hold this certification. 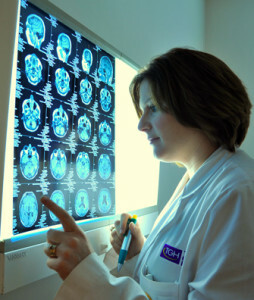 As a CNRN, you will be qualified to care for patients who have neurological challenges. These challenges may involve their brain and/or their nervous system. Some may be the result of injury and some the result of illnesses such as Parkinson’s, MS or encephalitis. As a trained neurological nurse, you may work in hospital or rehabilitation units that specialize in treating these kinds of illnesses and traumas. You will work with physicians, help administer medications, handle pre or post-operative care for patients and possibly monitor neurological testing. Neuroscience nursing is an important field that you can commit to for the long-term. Even if you decide to go on for further education, you can complete a masters level or higher degree to become an advance practice registered nurses (APRN). Some APRNs become nurse practitioners who may specialize in a number of areas, including neurology. Regardless of how far you decide to pursue your education, you will likely find it rewarding to specialize a nursing degree in neurology.